Though Brussels sprouts were developed somewhere in Europe, it is not on record whether their place of origin was really Brussels. A relatively modern vegetable, this nutritious member of the cabbage family was first cultivated in the 1600s or 1700s and didn’t become widely known in this country until the 1920s. Brussels sprouts tend to arouse strong emotions-people either love or hate them. Opinion probably hinges on the age of the sprouts first tasted: home-grown young sprouts are sweet and delicate, but store-bought older ones have a strong, cabbage flavour and odour and a coarse texture. 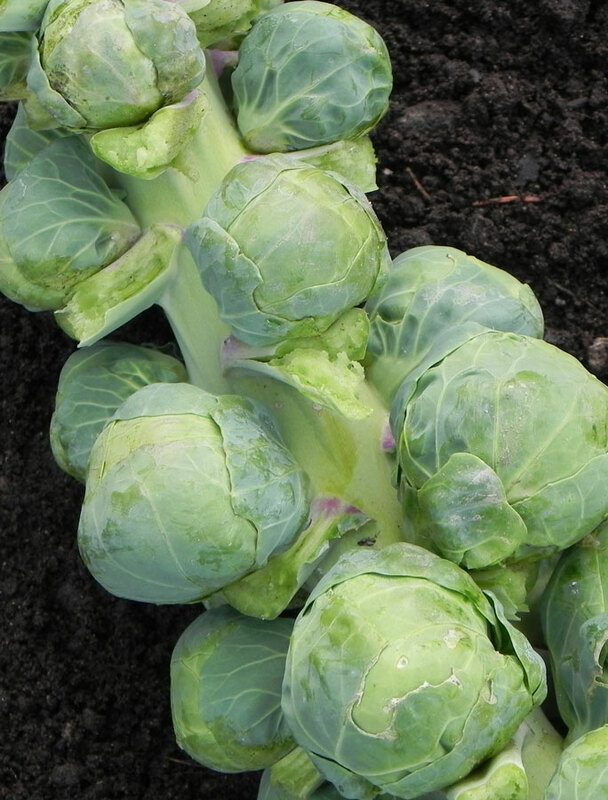 Brussels sprouts are a cool season vegetable and are easy to grow. Brussels sprouts belong to the cole crop family which includes broccoli, cabbage, cauliflower, collards, kale, and kohlrabi. They are peculiar-looking plants that resemble miniature palm trees with lumps-sprouts growing on the trunk. 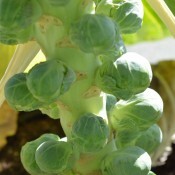 Since flavour is improved by heavy fall frosts, do not harvest Brussels sprouts until late summer or early fall. The sprouts mature from the bottom of the stem to the top, so harvesting each plant is a continuous process over the space of a month or two. One taste of the delicate nutty flavour a crispy, home-grown Brussels sprout and you will never eat another store bought one again. It is a great companion to beets, lettuce, calendula, and nasturtiums. Do not plant with beans, tomatoes, peppers, or strawberries. High in vitamin C, Brussels sprouts also contain significant amounts of vitamin A, thiamine, iron, potassium, and phosphorus. Like other members of the cabbage family, Brussels sprouts are considered helpful in the prevention of certain types of cancer. One cup of cooked Brussels sprouts (about 1/3 lb) has 56 calories. The sprouts mature through the late summer and are harvested after the first fall frost. Sprouts first form at the bottom of the plant and continue forming toward the top for several weeks. Pick solid, tightly closed, walnut-sized sprouts by snapping them off with a sharp downward tug or by cutting them clean with a sharp knife. As you remove the lower sprouts, remove yellowing leaves; the plant continues to grow upward, producing more leaves and sprouts. Brussels sprouts are best eaten the day of harvesting. unnwashed sprouts will keep for a few days in the refrigerator's crisper. Soak thoroughly in cold water, then drain well and pat dry. Trim stems and remove any discoloured or damaged outer leaves. Slice larger Brussels sprouts in half lengthwise to even out the cooking time.